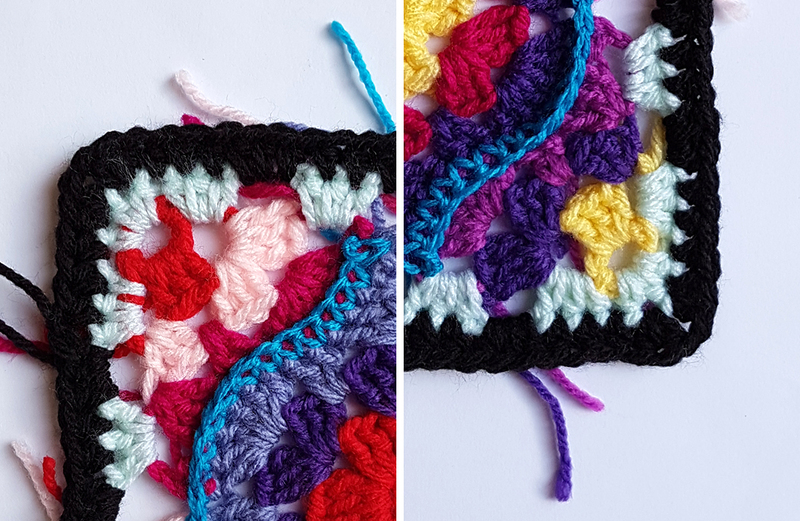 On Sunday I felt like making some crochet panels for a throw I’m working on, but it had to be something easy for Lazy Sunday Me – no keeping count of stitches on complicated pony legs. 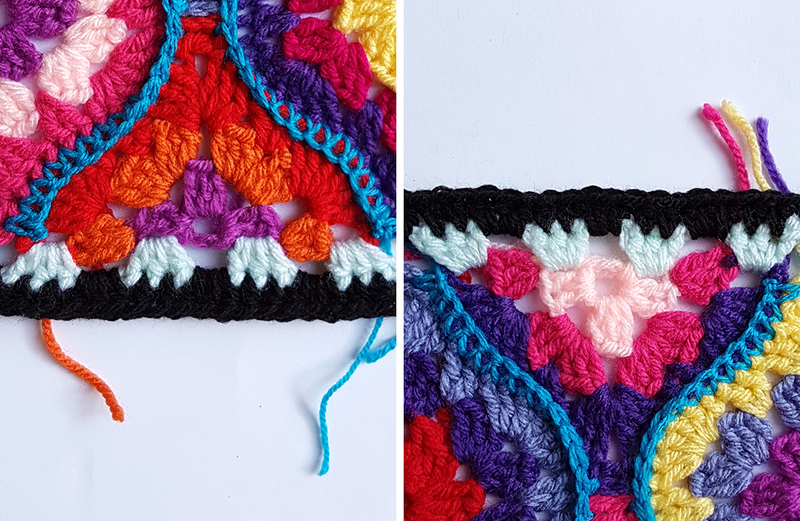 I was really lucky and the pattern came together on the first try – it tessellated perfectly and I only had to make a small change to get it to lie flat. Then I made halves and quarters for squaring off a panel of tiles. So quick and easy! Necessary Skills: The magic ring, and the crochet stitches listed below in abbreviations. Gauge: Using the suggested hook and yarn will produce a tile size of 145mm long by 115 mm wide. Try your own combos for different sizes! *YO, draw up a loop* 4 times. YO, draw through all 9 loops on hook. Ch1. Stitch complete! That’s a very good question! In my next post, I’m going to give you a very fancy calculator that will work out how many of each tile you need for ANY sized blanket – including sides, ends and corner tiles. 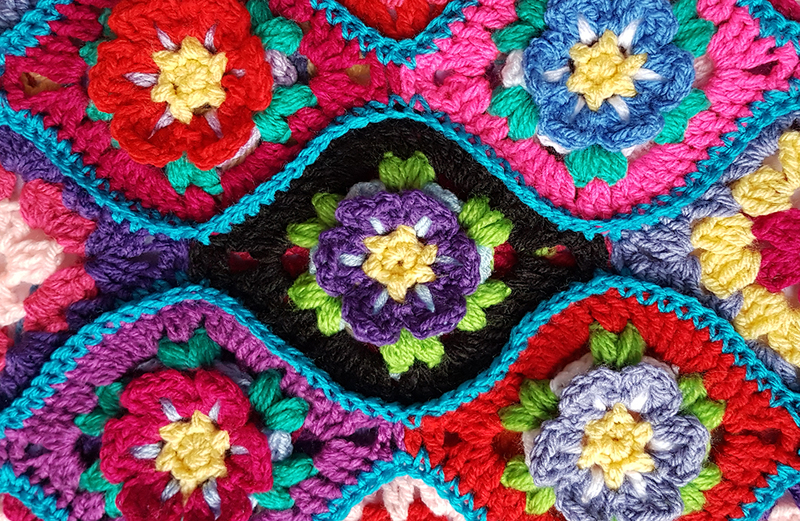 So you could use it for scarves, afghans, throws, cushion covers, bags – anything that’s a basic square or rectangle shape. 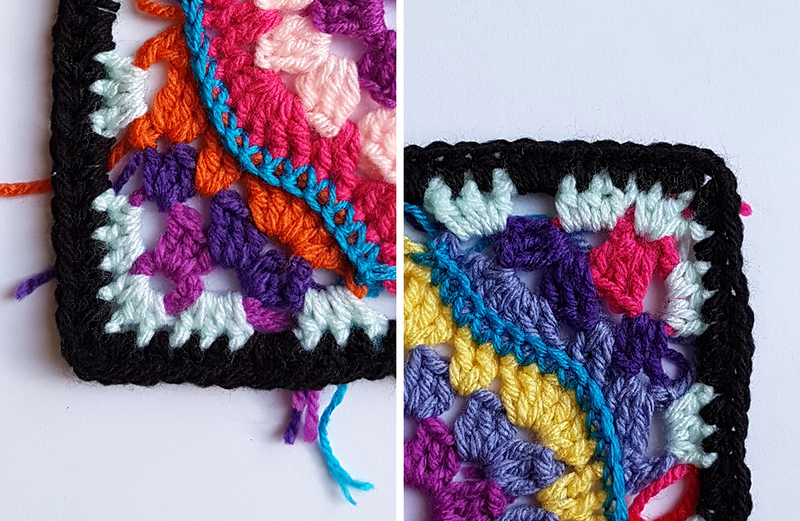 AND you can use it with any crochet tile that tessellates, not just Moroccan Garden tiles – even a basic hexagon, or squares that are staggered like bricks. Subscribe so you don’t miss it!! UPDATE: Tiler the Calculator is now live! R1: Using yellow yarn, 5 SC into a magic ring. Join with a SS into 1st SC. The loops formed by joining will count as a 6th SC. R2: Ch3 (counts as HDC, ch1). *HDC in next st. Ch1. * Repeat all around. Work your last HDC into the loops formed by joining in the previous round. Join with a SS into 2nd ch of starting ch. You should have 6 HDC, and 6 ch spaces. R3: With a knot on your hook, join flower colour to any ch1 space with a SS. *Ch3, 2DC ch3, SS into same space. SS into next ch space. * Repeat all around. Finish with a SS into the 1st ch1 space. Tie off. R4: Work behind your flower petals. 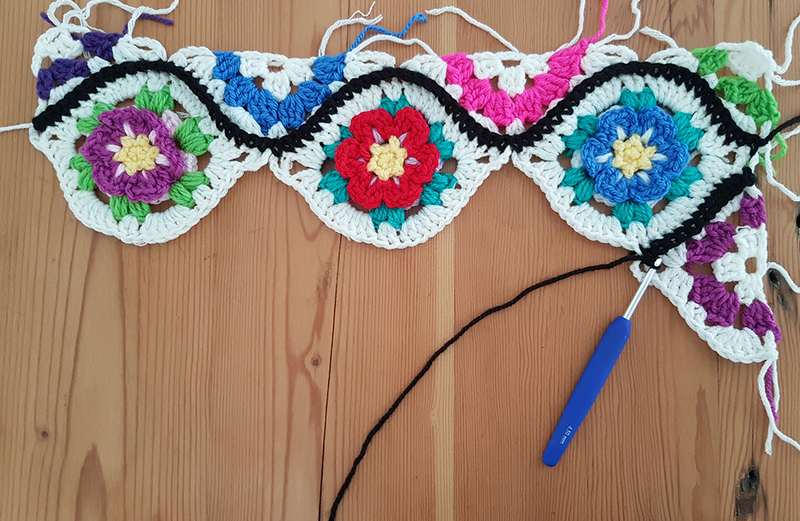 Using a contrasting colour insert hook between any 2DC (between stitch posts) and through the ch1 space. With a knot on your hook, join contrasting colour with a SS. Ch3 (counts as DC), 2DC in same space. *Ch2, 3DC into next petal. * Repeat all around. Join with a SS into 1st DC. Tie off. R5: With a knot on your hook, join green yarn with a SS to any ch2 space. Ch1. *2PS in same space, ch2. * Repeat all around. Join with a SS into top of 1st PS. Tie off. R6: With a knot on your hook, join new colour with a SS to any ch2 space. Ch3 (counts as 1st DC). 2DC in same space. *2DC between next 2 PS. 6DC in next ch space. * Repeat once more. 2DC between next 2 PS. 3DC in next ch space. Ch4, DC into 4th ch from hook. Work another 3DC into the same ch space as before. *2DC between next 2 PS. 6DC in next ch space. * Repeat once more. 2DC between next 2 PS. 3DC in next ch space. Ch4, DC into 4th ch from hook. Join with a SS into top of starting ch. Tie off. These tiles will fill up the gaps on either end of your panel. R1: Ch6. SS into 1st ch to form a Loop. Ch3 (counts as 1st st). 2DC into Loop. Cluster made. *Ch2. 3DC into Loop. * Repeat one more time. Tie off. R2: SDC with new colour in 1st st. 2DC in same st. *Ch2. 3DC, ch2, 3DC in next 2ch space. * Repeat once more. Ch2. 3DC in last st. Tie off. R3: SDC with new colour in 1st st. 6DC in next 2ch space. 2DC in next 2ch space. 3DC in next 2ch space. Ch 4. DC into 4th ch from hook. 3DC in same 2ch space. 2DC in next 2ch space. 6 DC in next 2ch space. DC in last st. Tie off. These tiles will fill the gaps along the top and bottom of your panel. R3: With a knot on your hook, join new colour at 1st st with a SS. Ch6. SC into 3rd ch from hook. 3DC into 1st st. *2DC in next 2ch space. 6DC in next 2ch space. * Repeat once more. 2DC in next 2ch space. 3DC in last st. Ch3. SC into 3rd ch from hook. Ch3. SS into last st. Tie off. R1: Ch6. SS into 1st ch to form a Loop. Ch4. 3DC into Loop. ch4. SS into loop. Tie off. R2: SDC in 4ch space. 2DC in same 4ch space. Ch2, 3DC in same 4ch space. Ch2. 3DC in next 4ch space. Tie off. R3: SDC with new colour in 1st st. 6 DC in 2ch space. 2DC in next 2ch space. 3DC in last st. Ch3. SC in 3rd ch from hook. ch3. SS into last st. Tie off. R2: SDC into 4ch space. 2DC in same ch4 space. Ch2. 3DC, ch2, 3DC in next 4ch space. Tie off. R3: With a knot on your hook, join new colour at 1st st with a SS. Ch6. SC into 3rd ch from hook. 3DC in 1st st. 2DC in next 2ch space. 6DC in 2ch space. DC in last st. Tie off. Begin with one Full Tile and a Top Right Quarter tile. Working through both layers, insert hook at 1st st on Quarter Tile and into ch space on Full Tile. Join contrasting colour with a SS, ch1. SC into same st. Continue working through both layers of both tiles, working 1SC into each st for a total of 12 sts. Work the 13th st into both the ch space of the Quarter tile, and into the Full Tile. Now add a Half Width tile. Working into the ch space on the Half Tile, and into the Full Tile, SC tiles together. Continue working through both layers of both tiles, working 1SC into each st for a total of 12 sts. Work the 13th st into both the Half Tile, and the ch space of the Full Tile. You can now add another Full Tile. Continue in this manner until your strip reaches the desired length, then finish with a Bottom Right Quarter Tile. Tie off. Working through both layers, insert hook at 1st st on Half Length Tile and into ch space on Full Tile. Join contrasting colour with a SS, ch1. SC into same st. Continue working through both layers of both tiles, working 1SC into each st for a total of 12 sts. Work the 13th st into both the ch space of the Half Tile, and into the Full Tile. You can now add another Full Tile. Continue in this manner until your strip reaches the desired length, then finish with a Half Length Tile. Tie off. Keep adding columns in the same way, working back and forth for each alternating column. Finish your last column with Half Width Tiles and Quarter Tiles. The border is worked into the side of the stitches of your tiles; in other words, around the post of the stitch. When there is a starting chain instead of a stitch, work around the chain (into ch space). 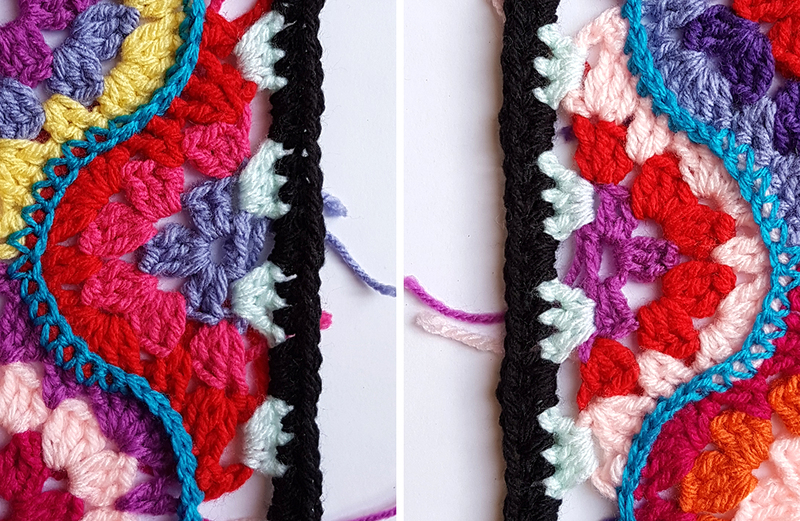 It’s a simple granny stitch pattern, worked into every second stitch, with 3 consecutive clusters of stitches in the corners. R1: Begin at the bottom right corner and work into the starting Loop. SHDC in Loop. 2HDC in same space. Working around chain on next row, 3 HDC in ch space. Ch2, skip next row. 3 HDC in next ch space. Ch2. On next tile 3 HDC in next ch space. Ch2, skip next row. 3HDC around next st post. Ch2, skip starting Loop. 3 HDC around next st post. Ch2, skip next row. 3HDC in next ch space. On the corner tile, 3HDC in ch space. Ch2, skip next row. 3HDC in next ch space. 3HDC into starting Loop. 3HD in next ch space. Ch2, skip next row. 3HDC into space. Ch2, skip next tile point. 3HDC in ch space on next tile. Ch2, skip row. 3HDC around next st post. Ch2, skip starting loop. 3HDC around next st post. Ch2, skip next row. 3HDC in next space. Ch2, skip next tile point. Continue in this manner for the entire row. You will notice your corner has 3 sets of 3HDCs consecutively. Repeat this in each corner. When you reach the end, SS into 1st HDC. Tie off. R2: Begin at the bottom right corner, in the first available 2ch space. With a new colour, SHDC in ch space. 2HDC in same space. Skip next HDC. HDC in next 2 sts. 3HDC in next 2ch space. Skip next HDC. HDC in next 2 sts. Skip next HDC. HDC in next 3 sts. 2HDC in next st. Ch2. 2HDC in next st. HDC in next 3 stitches. 3HDC in next 2ch space. Continue in this manner all the way around. Border complete! This edge makes a nice foundation for adding any kind of fancy border you want, to dress it up. I’m leaving mine plain because I’m adding this panel into a throw. You’re all done! 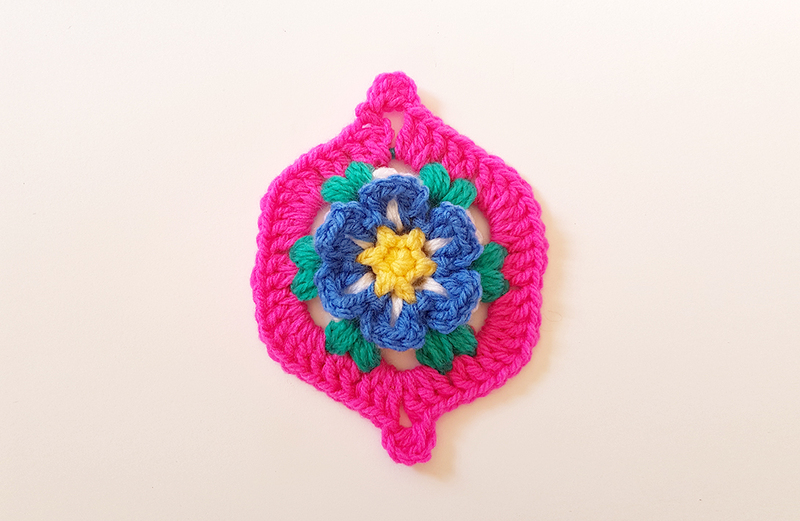 I hope you enjoy the pattern as much as I did, and if you like my pattern writing style why don’t you check out my Premium Pattern Collection for more crochet goodness! I would love to see what you guys make with this pattern – if you’re on Instagram please tag me @Projectarian with your #MoroccanGardenTiles photos!! Share this post with your fellow crocheters, and subscribe so you don’t miss out on future Projects! You may only share ONE image from this post. You are welcome to sell any physical item made from this pattern. Hi Jessie just love this pattern. I’m going to make a cushion cover with this pattern. Thanks for sharing. Thanks for share. I love the shape of the Moroccan tile and I love your pattern. What is the best way to tie off all the ends, I am relatively new to this – but to have all those loose end colors. How do you tie those off so they don’t show and don’t unravel? That’s my personal favorite technique. 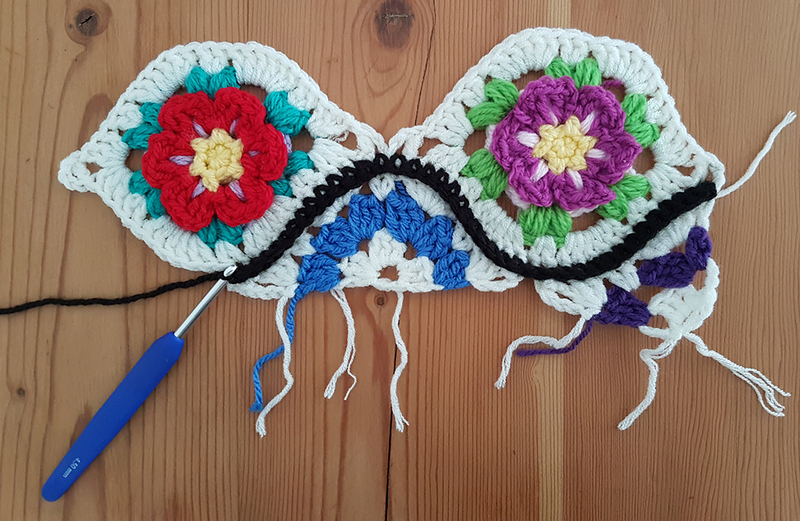 Although the example is done on Single Crochets, the same technique can be used on any stitches. Just make sure that you weave each end into crocheting of the same colour so it doesn’t show through. Thank you for the lovely comment, Alex! Enjoy your project! This is a beautiful design and I love the bright colours! It’s a winner! Thank you for sharing this project. I love this pattern thank you for sharing it. Can’t wait to make one myself. Thank you, Sandra. I’d love to see how you use it! What a stunning pattern ! I love colour just have to find time to make this ,no matter how grey the day seeing this first thing in the morning would make me feel like the sun was shining . Thank you. I’m so happy you like the pattern. Thanks for popping in! Love this. I will make a scarf. I’m glad you like it! Enjoy your scarf – I’m sure it will look amazing!! Thanks for your site, it has helped me so much. I honestly can’t think of anything that hasn’t been useful to me in one way or another……and the colours?????? Wow, the colours! I don’t know what else to say to you, but you will have me on here again I promise you. I am in love with this pattern! I am going to make this as soon as I can shop for yarn. 🙂 I am new to crocheting and even though this says it’s at a beginner level, I am nervous! Wish I could watch a video of you doing this. 🙂 However, I am going to “Go For it!” and do my best. I trust that I’ve made it clear enough for beginners to follow, and enable you to learn something new if you encounter a technique along the way that you haven’t tried before! If you get stuck, please don’t be shy to comment back here and ask for help – I’ll be happy to try make any challenging parts clearer. Hi 🙂 Do you have the translate in french for this pattern ? Ireally love this project I want to make this but my english is so,so.Could you help me please ? I’m glad you like the pattern. Unfortunately it’s only available in English for now. I’m so sorry! Thank you so much 🙂 Good luck, I hope it works out! I absolutely FLIPPED over this project! Thank you so much! It’s beyond gorgeous! Gorgeous pattern with rich colours. 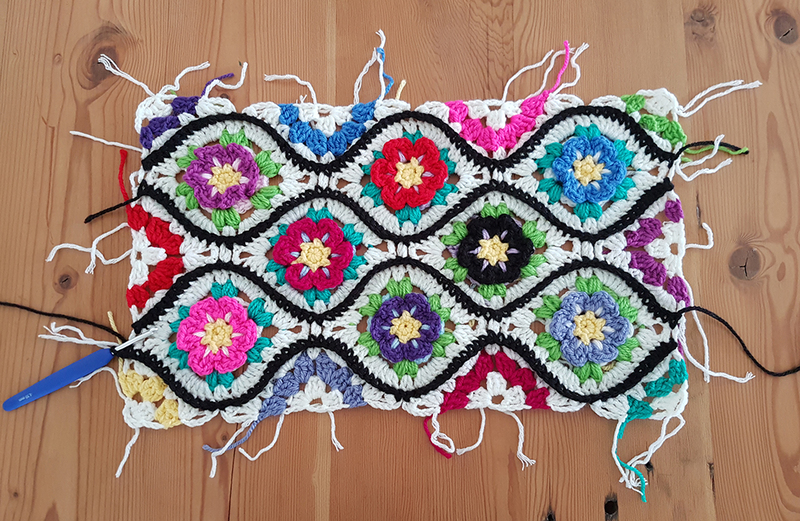 The pattern is beautiful and thanks for posting for free. Thanks Ashwini! You’re welcome and I’m so happy to hear you like it! Hi, This so Beautiful with Excellent presentation of Notes. My teenage daughter who loves everything in monotone tone colours loves this… It speaks volumes believe me. Stunning. Just found this pattern on AllFreeCrochet and link to your page. Stunning!! WAY better than the common granny square for using up left over yarn. Thanks Lynn, I’m glad you like the idea and I hope you enjoy your own project with this tutorial! THANK YOU for sharing this beautiful pattern. Your pix increase my confidence to make my own. I have lots of ‘scraps’ to use for a colorful result. I appreciate your mathematical mind to design what appears to be a complicated pattern, made ‘simple’. 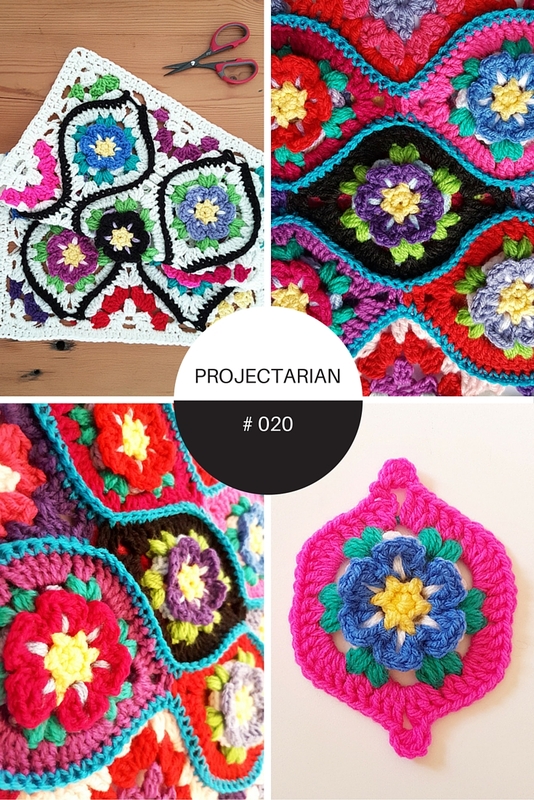 Your pattern is so amazing that I wished many more crochetters would see this page! Would propose your pattern (with link to this page) in Ravelry for example? I am sure many more people will have a crush on it. Love thr pattern. Cannot wait to try it. I’m really excited to try this pattern. Thank you for sharing! You’re welcome Janine, I hope you enjoy it! Muchas gracias por compartir, eres muy amable, tengo muchas ganas de hacer una manta con esta aplicación. You’re welcome Reme. Enjoy making your blanket! 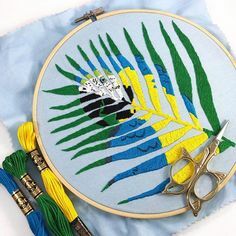 So beautiful, I can’t wait to try this pattern. Glad you like it Karen! You’re welcome Sara! It’ll be even easier to make with a wavy edge. Enjoy it!